Leona opened near Venice Pier in August 2015. Husband-wife team Kristian and Breegan Vallas envisioned a modern take on classic California style. The caramel leather and dark wood warm up the space. Orb lighting adds an industrial-chic touch. To achieve a beachy atmosphere, they applied palm-like wallpaper on the windowed front. Archival photographs from the Venice Historical Society hang on the walls. .
Barrel Down features one of the longest bars in Downtown L.A. The space welcomes natural light with its high ceilings and pale wood. To contrast the rough-hewn surfaces, designer Ricki Kline brought in a bold black hue. Enjoy one of the 40 taps of American craft beer atop the slate bar surface. .
Faceted pendants light up Crossings Restaurant in South Pasadena. The tall space calls for unique hanging sculptures. Cream glass feels elegant against the metal hardware and beautiful brick wall. Each fixture emits a soft glow for mood lighting. 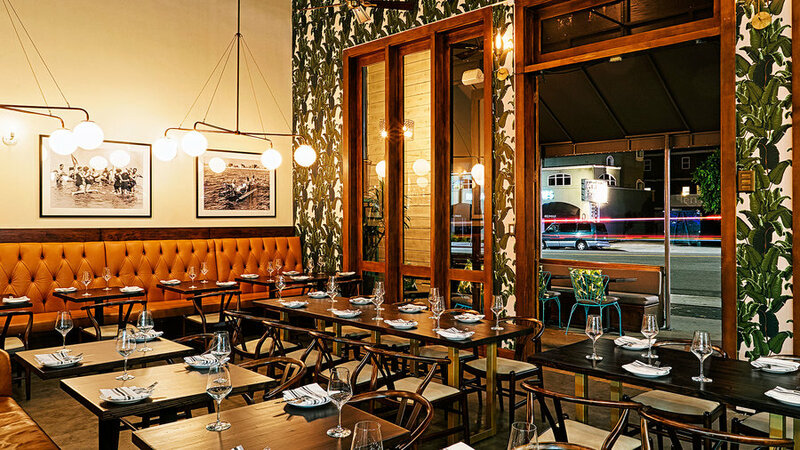 San Diego’s Jsix serves California fare in an urban-elegant setting. The East Village eatery nods to the city’s fishing history with cage-like light fixtures. 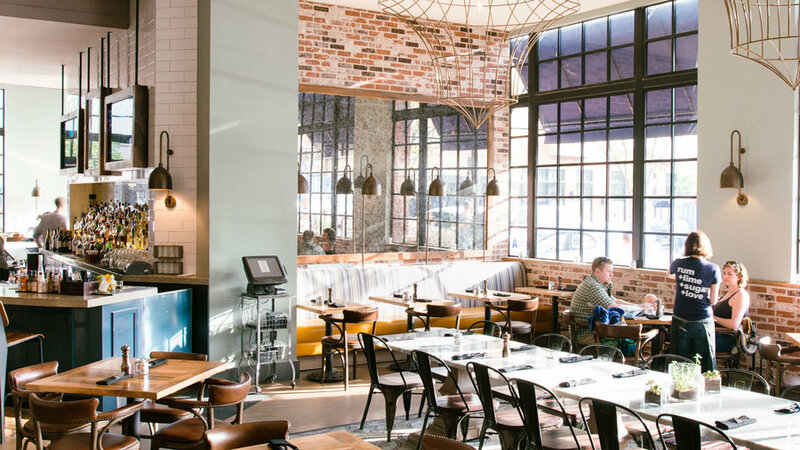 Exposed brick and industrial windows keep the heart of city architecture in the dining room. Stone on the communal tabletop mirrors the bar, while contrasting the reclaimed wood tables. Say aloha to playful design at San Francisco’s hottest Hawaiian restaurant, Liholiho Yacht Club. 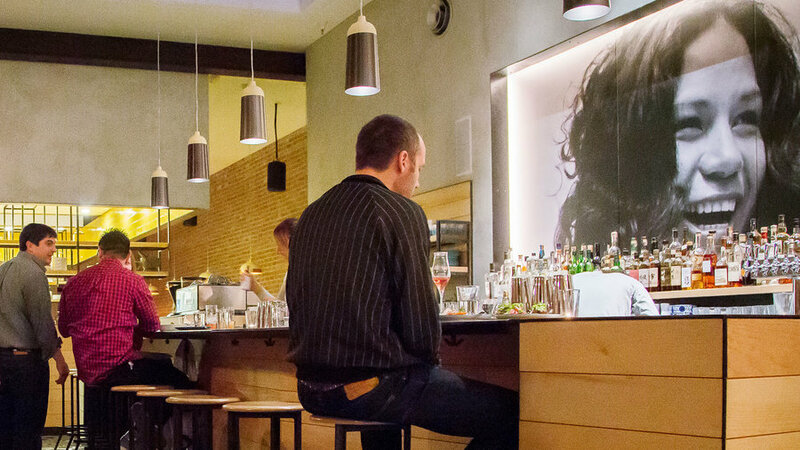 The Tendernob space catches your eye with a large-scale portrait behind the bar. The blue hexagonal tiles and paneled bar stand out. A sunny-yellow tiled kitchen stays open to the dining area in the back. The Henry in Phoenix calls itself “The Greatest Neighborhood Restaurant.” They’re certainly great at mixing materials. Teal plastic bucket seats top light wood legs held together by shiny metal. 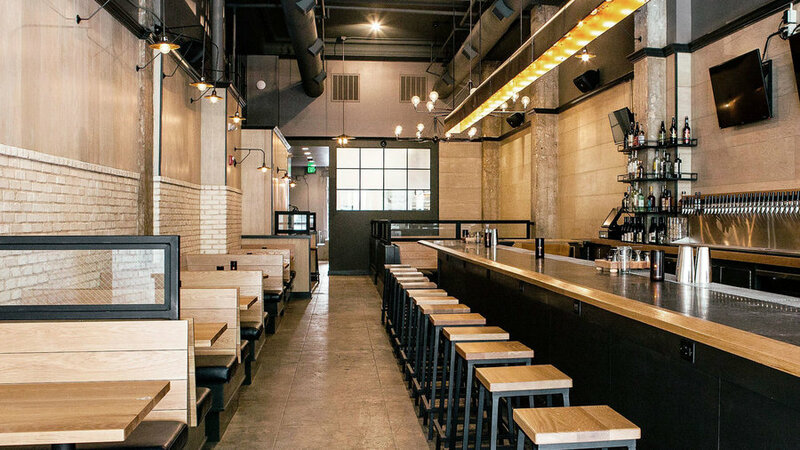 The bar features a dark wood surface contrasted against white subway tile. In the modern space, a vertical chalkboard reminds us of a classic bistro. 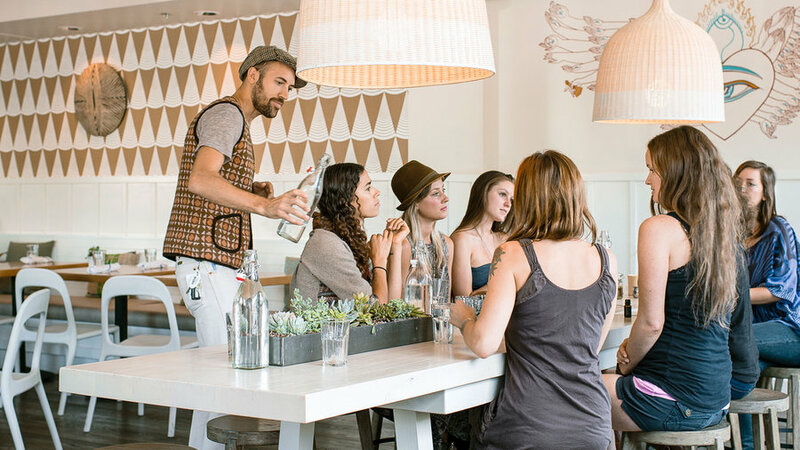 Café Gratitude in Venice nails the neutral color palette. Reclaimed wood stools balance the stark white acrylic table. 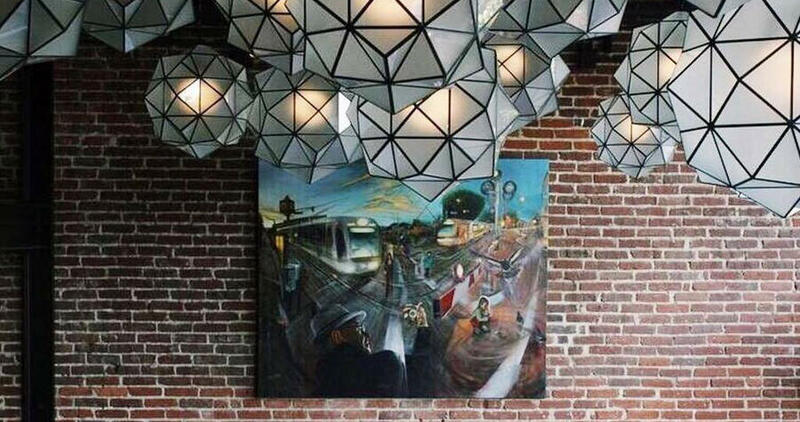 Massive lampshades connect the communal table. Custom printed walls with geometric shapes give personality to the space. Succulents bring nature to the table in the plant-based restaurant. You’ll find the Santa Barbara Wine Collective tasting room in a 1920s warehouse in the Funk Zone. Restaurateur Doug Washington applied neo-industrial design to the bar and seating area. Open shelves display the wines as a practical decor feature. 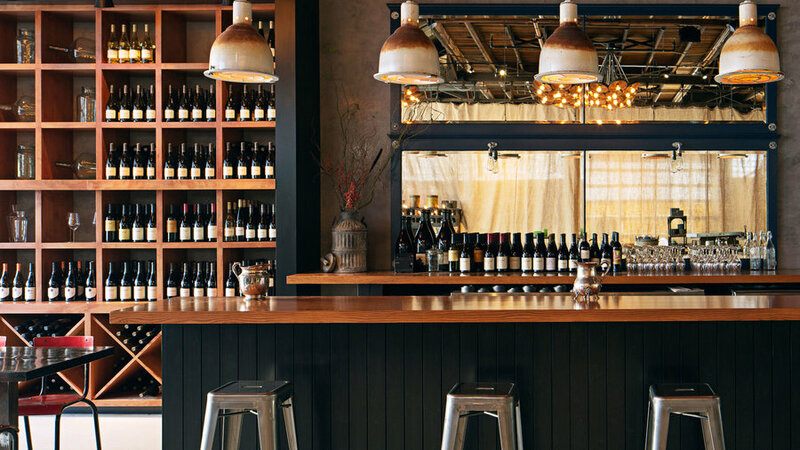 A mirror anchors the bar in the spacious setting, while pendant lights reflect the warehouse style. 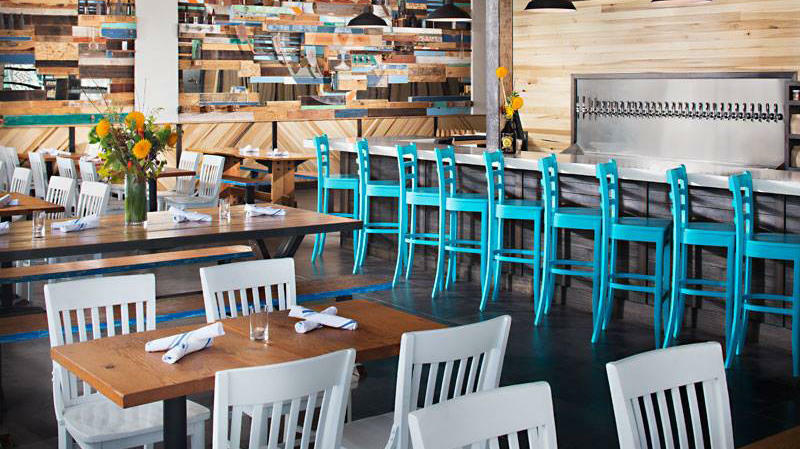 San Diego’s Waypoint Public goes all out on color. The beer restaurant pairs bold hues with a natural wood wall. 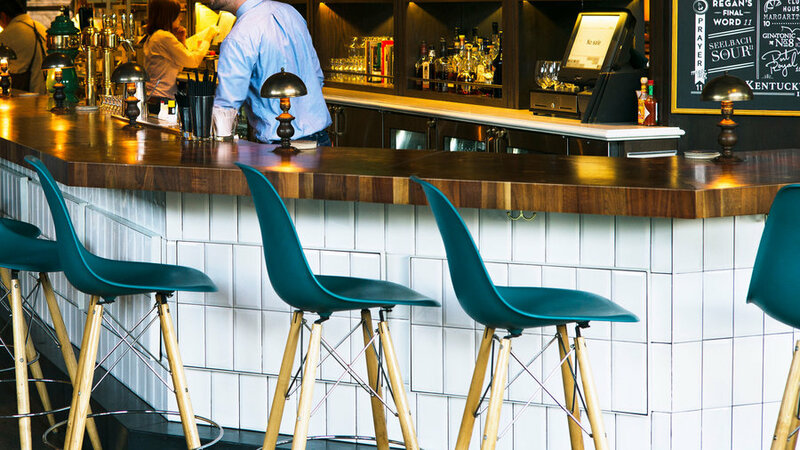 Bright blue bar stools meet a dark facade balanced by neutral paneling. A grassy green wall makes an energetic statement in the background. 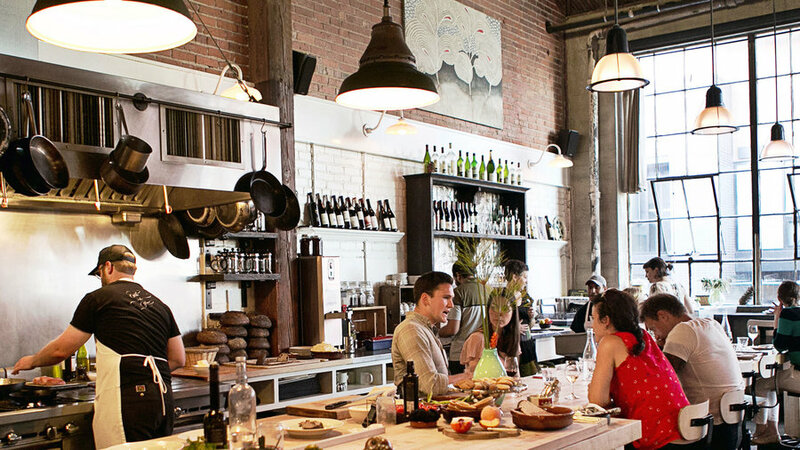 Sitka & Spruce revived an old auto shop in Seattle’s Capitol Hill. Guests sit beside an open kitchen on Toledo stools. The large butcher block island serves as a gorgeous, yet practical workspace with easy access to dishes on lower shelves. 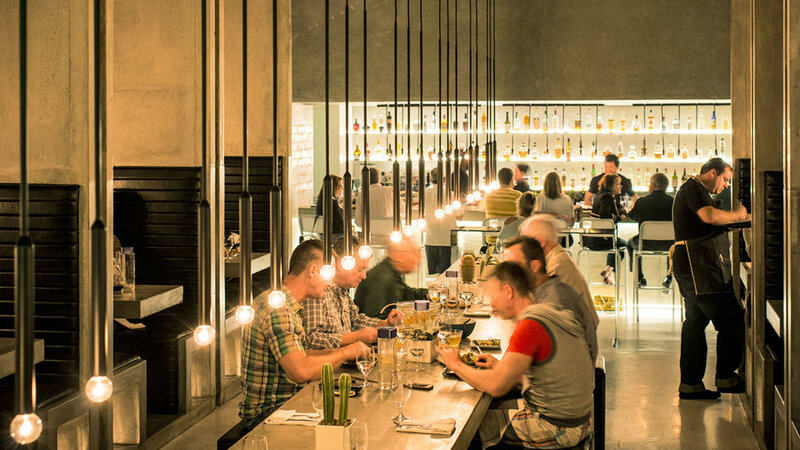 Diners commune on a lengthy, polished cement table at Palm Spring’s Workshop Kitchen + Bar. Slender wand-like fixtures light the space, and an assortment of cactuses lines the tabletop.